Played at Nord Park, Düsseldorf, on Saturday 4 July 2009. Result : Düsseldorf won by 152 runs. 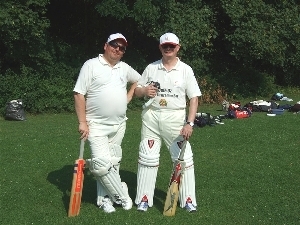 An under strength Lille Cricket team travelled three hours to Düsseldorf to take on the Düsseldorf Blackcaps in an attempt to avenge our 88 run defeat on home soil in May of last year. The European summer continued to be kind providing a warm and humid day and when the Blackcaps won the toss and chose to bat, Lille knew it was going to be hard work keeping the score to a minimum over the next 25 overs. Despite Lille being short on available players, requiring both club president and vice-president to don the whites as well as acquire the services of one of the Blackcaps players, the Blackcaps innings began in disastrous fashion. Szumowski, the Lille captain, who decided to use the new ball ripped through the top order batsmen taking one wicket in each of his first three overs and excellent fielding from Adam Wentworth and Robin Richardson to execute a run out saw the Blackcaps reeling at 34 runs for 4 wickets. Unfortunately this euphoria was short lived for the Lillois as player of the match Pardeep accompanied by Tarin notched a handy 53 run partnership with the change of bowlers and this was followed by another 50+ run partnership by Pardeep and Harman to see the Blackcaps cruising at 141 runs for 6 wickets with another eight overs remaining. Nauman earned his one wicket to dismiss Tarin thanks to a catch by substitute Ravi before Szumowski brought himself back into the attack to dismiss Pardeep for an excellent 41 runs. The big hitting Harman was next to go for 26 runs thanks to a leaping one handed snare in the outfield by Szumowski off the bowling of Ravi who also took the eighth and final wicket for Lille when Aman on 22 runs edged the ball into the ever safe hands of Fletcher. Ill-disciplined bowling resulted in Lille conceding more than 40 runs in extras and the Blackcaps closed their innings after the allocated 25 overs with 201 runs for the loss of 8 wickets. With a large mountain to climb and most of Lilles recognised batsmen sitting in their lounges back home in Chtiland, the brave Lillois took the pitch ready to face the fire from the Blackcaps bowlers. It only took 4 balls before the Germans would strike when Szumowski was clean bowled by Bipin for a duck and both Foster and Alfar Jiffry followed not long after in similar fashion to have Lille in big trouble at only 7 runs for 3 wickets. Richardson elevated to number four in the batting line up did well to occupy the crease and along with Ravi they managed to add 19 runs before a breakdown in communication led to Richardson being run out for 4 runs. Ravi then followed for a top score of 11 runs holding out to Malik off the bowling of Mudi with the first of his four wickets. The wickets continued to tumble at a regular pace; Nauman caught trying to pull a short ball for 2 runs, Florien Jiffry bowled first ball, Adam Wentworth spooning a dolly to short square leg for 0 runs, Bollaert was gallant in facing 22 balls before playing exactly the same shot as Wentworth and was caught for 1 run, and the final wicket fell on 49 runs when Fletcher who looked the goods in warming up was caught for Lilles fourth duck of the innings. President Banton showed grit and determination to remain not out with 2 runs next to his name but the Blackcaps proved far too superior for Lille on the day making it 2-0 for the records and a possible invitation to Lille crickets annual Twenty20 tournament a possibility so that the Lillois can finally get some revenge. Despite the poor showing from the Lille lads a great day was had by all, there was a tasty picnic lunch upon arrival, the match was played in excellent spirit by both teams, and no doubt those who stayed the evening in Düsseldorf enjoyed the Blackcaps hospitality and nightlife of the biggest little village on the Rhine.